Every so often a dwelling really surprises us here at homify HQ. It might be the property’s style, architectural form, or something small such as the decorative ornaments within. Today’s feature home is one such dwelling. Rustic and bucolic, with elements of country-style warmth; this townhouse is situated in the centre of a bustling urban metropolis. 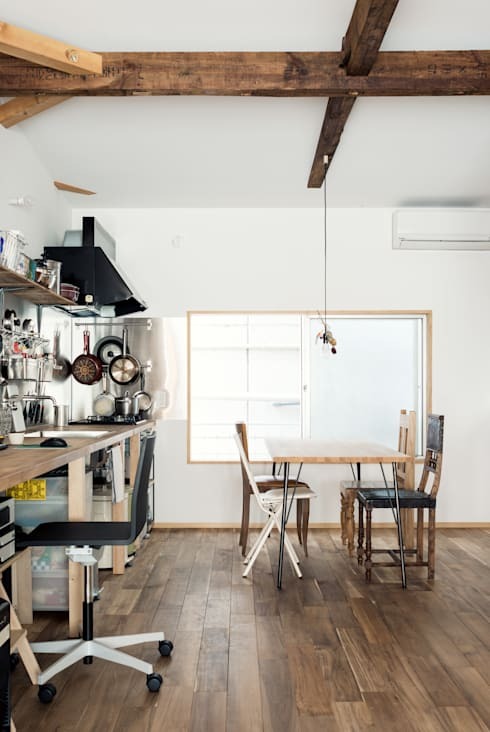 Located in Japan, the house takes on two very different aesthetics, and seamlessly combines them. On the one hand, this abode is traditional and rustic, and on the other it is an avant-garde, eclectic residence, brimming with unique accents. Are you curious to see more? If we’ve piqued your interest, check out the Coil-designed home in its entirety below! Our first view of this home provides us with a rather simple townhouse, that wouldn't look out of place in a number of the city's neighbourhoods. However, upon closer inspection, we see that this is no ordinary abode. 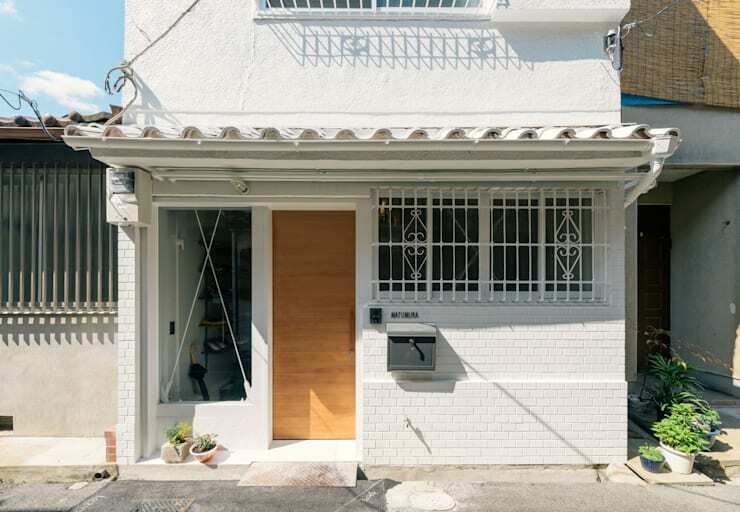 The light timber door beckons with its modernity, while the white façade is eye-catching and bright. 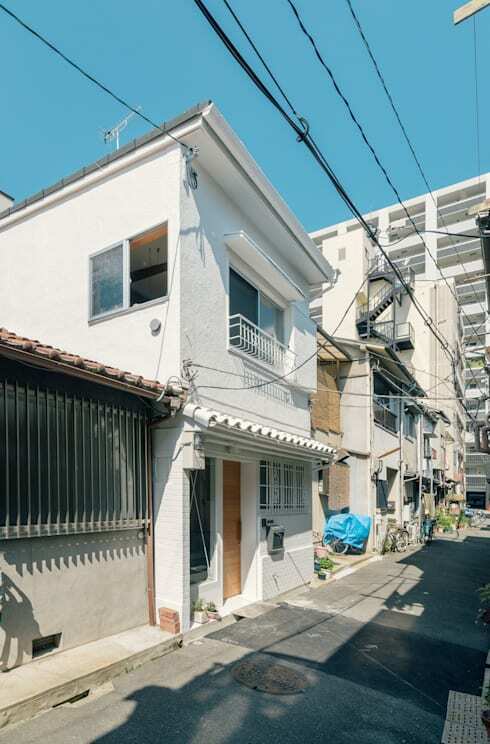 Matching the surrounding architectural vernacular, this home doesn't try to stand out from the crowd; rather it is a part of the neighbourhood, at one with the goings-on within this nondescript inner city locale. As we enter the home, we are immediately presented with a modern and contemporary interior setting. The ambience is modern, yet still boasts a feeling of tradition and heritage. 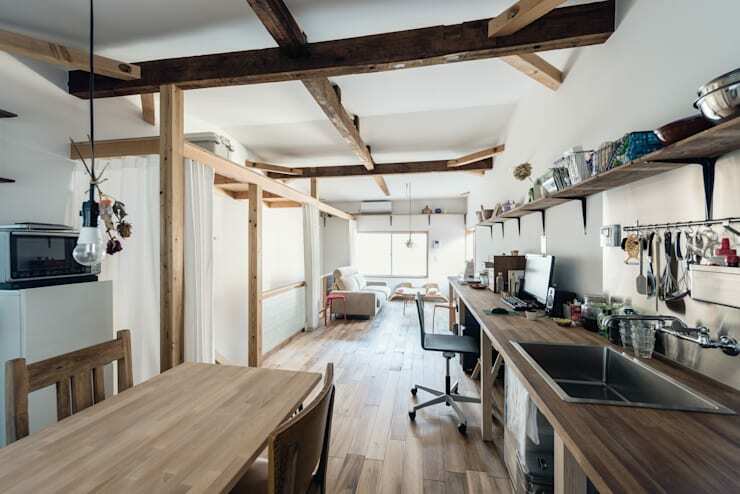 The architects have opted to keep the exposed timber ceiling beams, contributing to the sense of connection with the environment, as well as the structure's history as well. As this is the top floor, we are able to see how certain internal walls have been removed. This adds to the long linear feeling of the room, while also imparting a sense of spaciousness. We chose the term planned chaos for this image, as it accurately describes the interior aesthetic that is maximalist, yet still combines elements of minimalism. 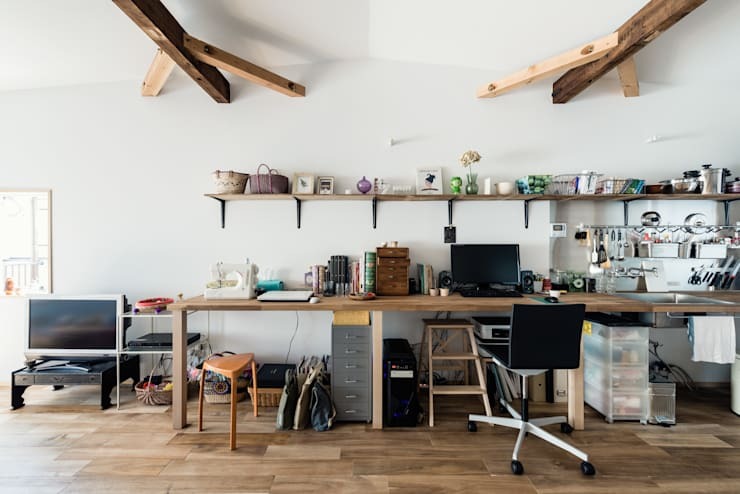 This is the workspace and home office for the house, and blends in well with the adjacent kitchen, by utilising the exposed shelving along the entire wall. Turning around to face the room from a different direction, we are able to see the kitchen and dining room in more detail. The dining room is an inspirational space thanks to its minimal use of furniture, but the intrinsic sense of individuality and uniqueness. The furniture is vintage, which contributes to the shabby-chic vibe, while a single light fitting hangs delicately from one of the ceiling rafters, imparting simplicity and a sleek atmosphere. To the left we see the kitchen. This space is very much like many other areas of the home, with a white colour scheme, open cabinetry, and exposed utensils. Characterful and charming, it coordinates brilliantly with the other elements and features of this large, linear room. When we think of our own entrance spaces, we often picture the mess and untidiness that is associated with the front of a house or apartment. 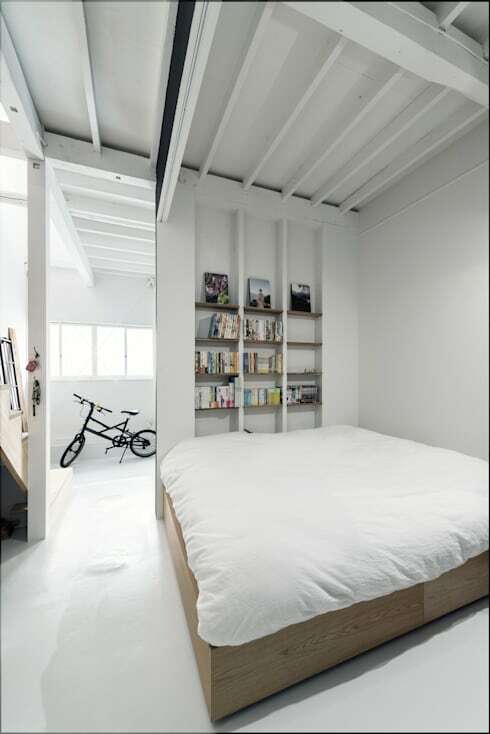 However, this dwelling truly impresses with its tidy, ordered and organised aesthetic. The entry foyer is simple and sleek, boasting a white colour scheme, from floor to ceiling. 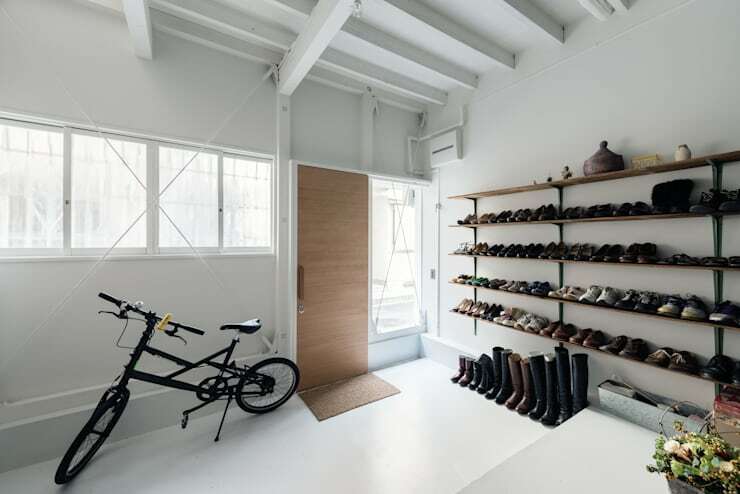 The shoe storage to the left wall works as a piece of art, as much as a simple space to keep one's footwear. Perfectly clean, alluring and enjoyable, this entrance is truly surprising! 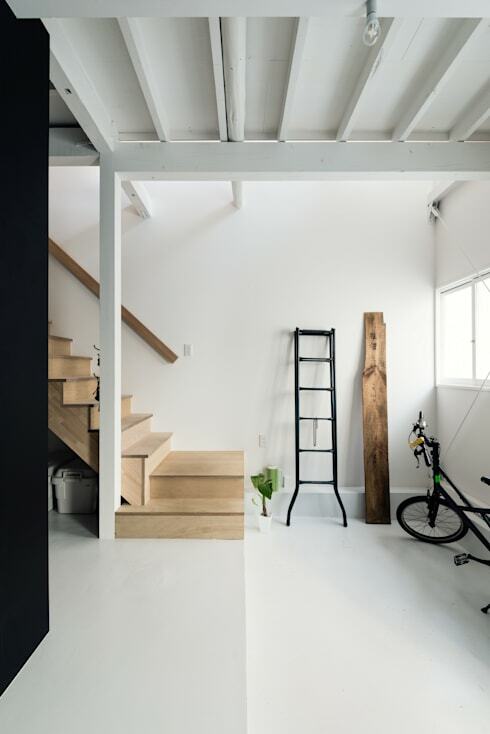 To quickly take a look in the other direction, we notice the light timber stairs, which work beautifully against the all-white colour scheme. This room is a cleverly designed space that offers a range of carefully chosen ornaments, and practical yet stylish accessories. To promote restfulness, as well as control the temperature of the space, the bedroom is located downstairs behind the main entrance. 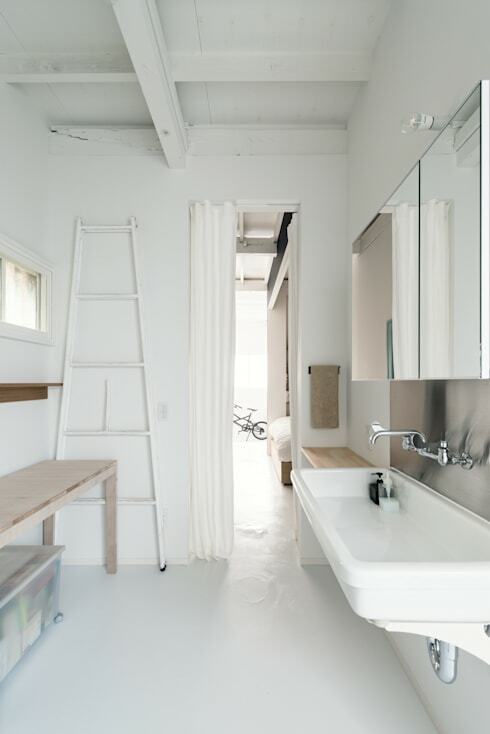 Simple, minimal and oozing serenity, this is definitely the ultimate location for rest and relaxation. Built into the structural shape of the wall, bookshelves have been added. These are some of the only decorative features in the space, and offer the occupant a distraction from the highly minimalist room. Last, but certainly not least, we head further into the dwelling, behind the bedroom and check out the bathroom. This area of the dwelling certainly doesn't disappoint, offering a neat collection of modern furniture, contemporary joinery and again, the all-white colour scheme. What did you think of this intriguing abode?